Soup season is upon us friends! The weather here in Seattle has flipped a switch from 90 and sunny to 60 and rainy and I couldn't be happier. I've been dreaming of cozy blankets and cozy warming foods for months now. I recently took a leap and bought myself a Vitamix blender..which has been on my dream list for about as long as I can remember. I can now blend up just about ANYTHING including creamy soups. One of the best parts about making soups is not only do they make great leftovers, but can easily be kept low calorie! There are quite a few soups I make on repeat throughout the cooler months.. vegetarian crockpot chili, mushroom leek & chicken soup, a copy-cat Zuppa Toscana recipe are a few honorable mentions. Last fall I discovered my love for Roasted Tomato Basil Bisque and that's what I'm going to share with you today. The whole point of this soup is to skip the easy step of buying canned tomatoes... which you can do..but I promise roasting your own is well worth it. (and only takes an hour) If you're feeling adventurous... 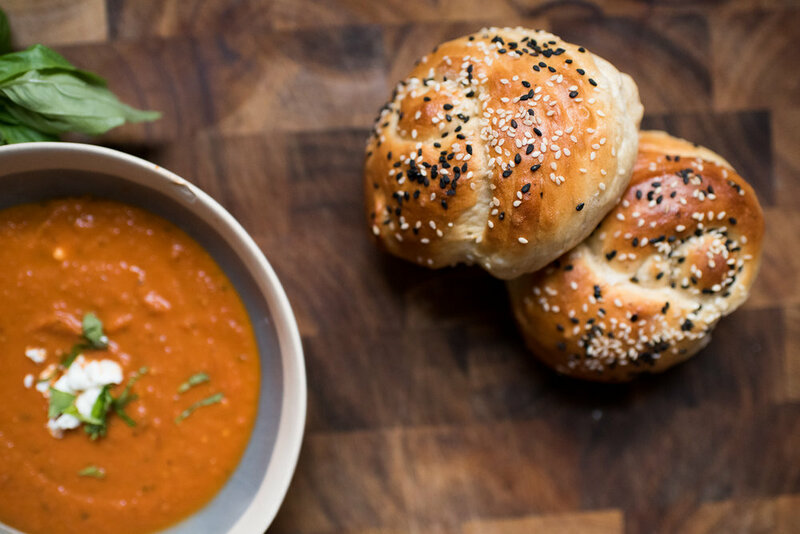 I highly encourage you make my Challah Sesame Rolls shown below to use as dipping devices for this soup. If you'd rather make a loaf version of the bread, check out the recipe here. This soup is vegetarian, gluten + grain free, and can easily be made vegan..just leave out the cheese! Once the tomatoes, onions and garlic are fragrant and soft, remove from oven allow them to cool for 10 minutes. Add them to a food processor or high powered blender and blend until smooth. If you want a chunky soup, blend accordingly. Add basil and blend again. Transfer to a large pot, turn to medium low heat and add in oregano, vegetarian broth, tomato paste and salt and pepper to taste. Allow tomato soup to simmer at least 10 minutes before serving. Taste and add more salt and pepper if needed. Sometimes a touch of brown sugar evens out any tartness. To serve, garnish with goat cheese and freshly chopped basil! Don't forget your challah roll or grilled cheese! First make your starter by mixing starter ingredients from above: 1 cup flour, 1 cup water and yeast in a large bowl. I mixed mine up in the bowl of my kitchen aid mixer. Let the mixture sit for about 45 minutes. Add all dough ingredients from above to the yeast starter from step 1 and mix. I set my mixer on low and slowly added flour until all was incorporated. I then removed dough and worked it a tiny bit with floury hands and surface until it was no longer sticky. The butter in this dough makes it so nice and silky to work with. Place the dough in a lightly greased bowl and roll around to coat most sides with a bit of oil. Cover and let rise in a warm place for about 1 1/2 hours, or until it's not quite doubled in size. Once risen, turn the dough out onto a floury surface and using floury hands, fold it over once or twice and reshape. Divide the dough into 12 equal parts. On a floury surface roll out each piece of dough into a strand about 1 inch thick and 8-10 inches long, take both ends of dough strand and tie into a knot and place on a greased baking sheet. Knot the remaining 11 pieces and place on one or two baking sheets, giving enough space inbetween for the rolls to rise and expand. Make the glaze by mixing together an egg white, sugar, and water. Gently brush the rolls, saving the rest for a 2nd brushing post rise. Cover rolls with lightly greased plastic wrap and a towel and allow rolls to rise for 45 minutes to 1 hour, or until they are almost doubled in size. Towards the end of the rising time, preheat the oven to 375°F. Once ready to bake, brush the rolls again with the remaining egg wash (this will give the finished loaf a beautiful, shiny crust, as well as provide "glue" for the seeds), sprinkle or 'dab' with seeds of choice and bake for 18 to 28 minutes, or until the rolls are golden brown, slightly firm to the touch, and the internal temperature is 195°F. Check at 15 minutes and then every 5 minutes until they are done. Don't over bake! Remove the rolls from the oven, and let cool on rack! Best eaten while warm:) Store once cool in ziplock bag.